This hotel booking engine is owned and run by Roomex Limited. Roomex Limited (“Roomex”) is committed to complying with our data protection obligations. In this context, and to achieve consistency and excellence of service, we believe that it is important to have a policy setting out how we manage document retention. The General Data Protection Regulation (the GDPR) and the Data Protection Act 2018 impose obligations on us, as a Data Controller, to process personal data in a fair manner which notifies data subjects of the purposes of data processing and to retain the data for no longer than is necessary to achieve those purposes. Under these rules, individuals have a right to be informed about how their personal data is processed. The GDPR and Data Protection Act set out the information that we should supply to data subjects and when data subjects should be informed of this information. We are obliged to provide individuals with information on our retention periods or criteria used to determine the retention periods. Under the GDPR, Roomex are required to provide data subjects with the lawful basis that they are relying on for processing personal data. Explicit consent is required where special categories, also known as sensitive personal data are being processed. Roomex may be able to rely a number of legal bases for collecting personal data. For example, as employers, Roomex can justify processing an employee’s personal data as necessary for the performance of a contract and as part of a statutory requirement. If there is no justification for retaining personal information, then that information should be routinely deleted. Information should never be kept "just in case" or because it “always has been kept”. If we want to retain information about our users of Roomex services to help us to provide a better service to them in the future, we must obtain their consent in advance. Further retention of the personal data should be lawful only when it is compatible with the purposes for which it was originally collected. In this case no separate legal basis is required- it should be relied on where it is necessary, for exercising the right of freedom of expression and information, for compliance with a legal obligation, for the performance of a task carried out in the public interest or in the exercise of official authority vested in the data controller, on the grounds of public interest in the area of public health, for archiving purposes in the public interest, scientific or historical research purposes or statistical purposes, or for the establishment, exercise or defence of legal claims. where the processing of his or her personal data does not otherwise comply with the GDPR. This right is relevant in particular where the data subject has given his or her consent as a child and is not fully aware of the risks involved by the processing, and later wants to remove such personal data, especially on the internet. The data subject should be able to exercise that right notwithstanding the fact that he or she is no longer a child. 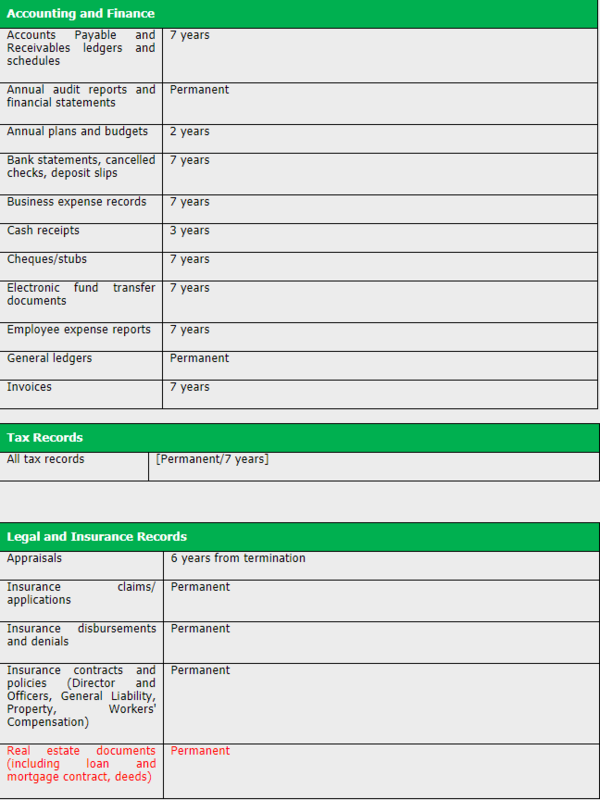 Must be kept in order to satisfy legal, accounting or other regulatory requirements. We must balance these requirements with our statutory obligation to only keep records for the period required and to comply with data minimisation principles. 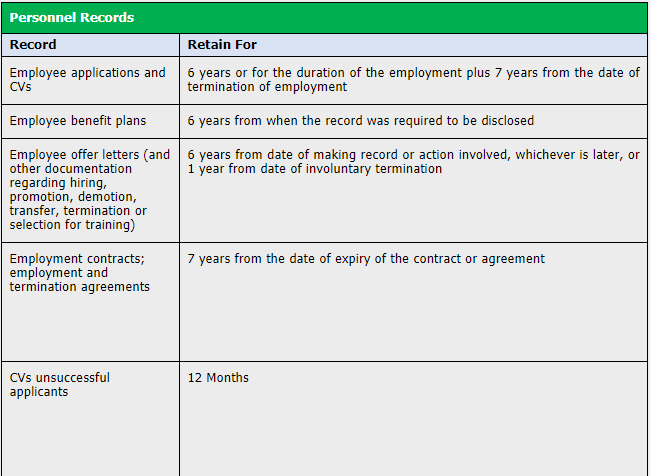 The retention schedule below sets out the relevant periods for the retention of Roomex’s documents. This policy explains the differences among records, disposable information, personal data and confidential information belonging to others. Audio and video recordings (including CCTV). Detachable devices such as USB and memory sticks. Memory in mobile phones and PDAs. Online postings, such as on Facebook, Twitter etc. Other identifiable repositories where documents are kept. Therefore, any paper records and electronic files, that are part of any of the categories listed in the Records Retention Schedule contained in the Appendix to this policy, must be retained for the amount of time indicated in the Records Retention Schedule. A record must not be retained beyond the period indicated in the Record Retention Schedule, unless a valid business reason (or a litigation hold or other special situation) calls for its continued retention. If you are unsure whether to retain a certain record, contact the Data Protection Officer. Duplicates of originals that have not written notes on them. Preliminary drafts of letters, memoranda, reports, worksheets and informal notes that do not represent significant steps or decisions in the preparation of an official record. Books, periodicals, manuals, training binders and other printed materials obtained from sources outside of Roomex and retained primarily for reference purposes. Back up data for technical purposes. Personal Data is defined as any data which can identify an individual either on its own or when combined and linked with other data which we possess. Some examples of personal data include names and addresses, email addresses, CVs, details of previous employment, medical records and references. We have specific obligations relating to personal data as set out in the GDPR. Arranging for the storage and retrieval of records, coordinating with outside agencies where appropriate. Handling the destruction of records whose retention period has expired. Planning, developing and prescribing document disposal policies, systems, standards and procedures. Developing and implementing measures to record what information Roomex has and where it is stored, that only authorised users have access to the information, and that Roomex keeps only the information it needs, thereby efficiently using space. Establishing protocols for filing and storage equipment and recordkeeping supplies. Identifying essential records and establishing a disaster plan for each office and department to ensure maximum availability of Roomex’s records in order to re-establish operations quickly and with minimal interruption and expense. Periodically reviewing the records retention schedules and legislation to determine if Roomex’s document management program and its Records Retention Schedule is in compliance with legislation. In conjunction with the HR Department explaining to employees their duties relating to the document management program. Ensuring that the maintenance, preservation, microfilming, computer disk storage, destruction or other disposition of Roomex’s records is carried out in accordance with this policy, the procedures of the document management program and our legal requirements. Roomex’s records must be stored in a safe, secure and accessible manner. Any documents and financial files that are essential to our business operations during an emergency must be duplicated and/or backed up at least once per week and maintained off site. Roomex’s Records Management Officer is responsible for the process of identifying records that have met their required retention period and supervising their destruction. The destruction of personal data, confidential, financial and personnel-related records must be conducted by shredding. The destruction of electronic records must be coordinated with the IT Department or in conjunction with Roomex’s I.T service provider. Any documents subject to litigation hold must not be destroyed. Any questions about this policy should be referred to the Data Protection Officer who is in charge of administering, enforcing and updating this policy. 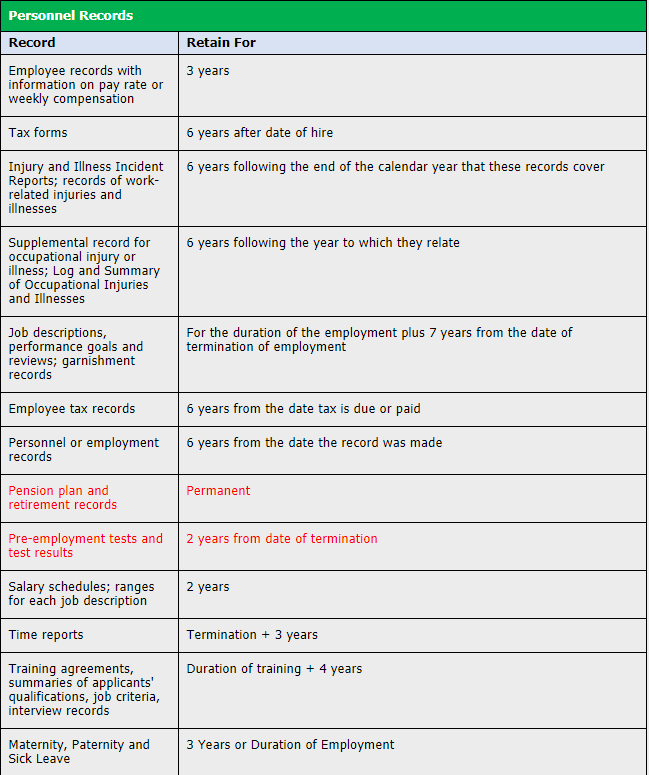 In this policy Roomex establishes retention or destruction schedules or procedures for specific categories of records. This is done to ensure legal compliance and accomplish other objectives, such as protecting intellectual property and controlling costs. 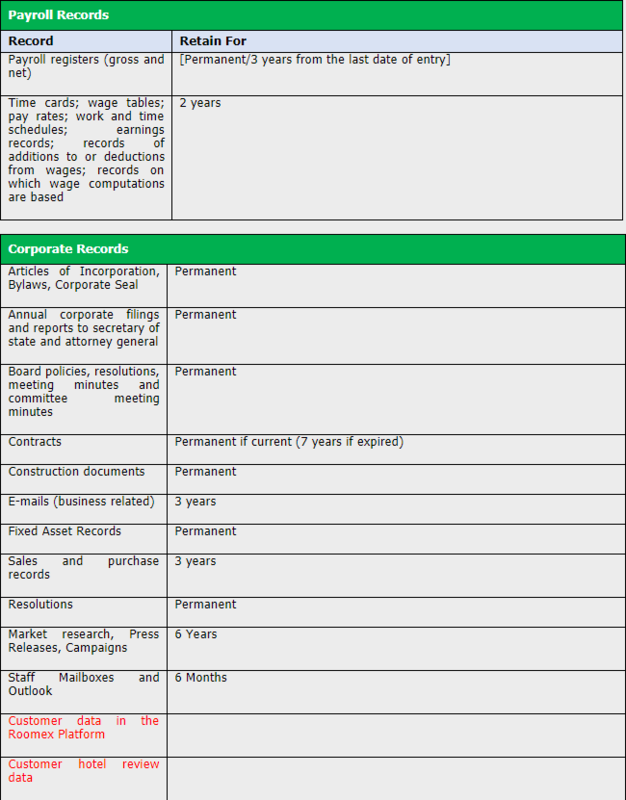 Employees should give special consideration to the categories of documents listed in the record retention schedule below. Avoid retaining a record if there is no business reason for doing so, and consult with the Data Protection Officer/Data Protection Contact or Legal Department if unsure.